Professor Willow is seeking Trainers to help study the mysterious world of Pokémon. By completing Research tasks, you can contribute to the Professor’s discoveries and earn rewards for yourself at the same time. Research Tasks may include objectives such as catching certain Pokémon, walking a certain distance with your Buddy Pokémon, or winning Gym Battles. For each task you complete, you’ll unlock a reward. The more challenging a research task is, the greater the reward. When you complete a series of research tasks, you’ll unlock even more rewards. There are two different types of Pokémon Research: Field Research and Special Research. Field Research tasks can be collected by visiting nearby PokéStops. Special Research is guided by Professor Willow with more challenging tasks but with greater rewards. To collect Field Research tasks, spin the Photo Disc at nearby PokéStops. 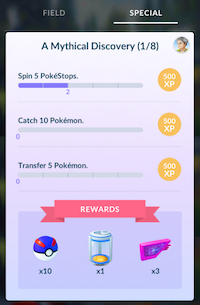 You can collect one Field Research task per PokéStop per day. You’ll receive a notification on the bottom-right corner of the screen when you collect or make progress on your tasks. In Map View, tap on the Research icon to view your current tasks. 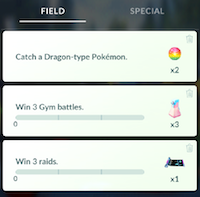 You can collect and make progress on up to 3 Field Research tasks at a time. After you complete a task and claim its reward, you free up space to collect another task. If you find a task too difficult, you have the option to discard it. Tap the trash icon in the corner of the task. As you complete more tasks, you earn Stamps which unlock Research Breakthroughs. You can earn up to one Stamp per day for each Field Research task you complete. After you earn 7 Stamps, you will achieve a Research Breakthrough and receive additional rewards. Note that you do not receive Stamps for Special Research. Tip: You can complete Field Research tasks together with friends. You and your friends will receive the same Field Research task if you visit the same PokéStops on the same day. Special Research is similar to Field Research but different in several ways. Unlike Field Research, Special Research cannot be obtained by spinning PokéStops. Rather, Professor Willow will contact you directly to request assistance with Special Research. These tasks will take you on a multiple part journey to make important discoveries. You cannot discard Special Research tasks. Like Field Research, Trainers receive a reward for each Special Research task they complete. After they complete a series of Special Research tasks, Trainers unlock even greater and more valuable rewards for their contributions. While Trainers cannot repeat Special Research tasks, Professor Willow will periodically seek assistance with new tasks.